Moscow -- A Russian cosmonaut and an American astronaut are in "good condition" after a booster rocket on their spacecraft failed and forced them to make an emergency landing Thursday, both countries' space agencies said. The Soyuz MS-10 rocket took off at 4:40 a.m. local time on what was supposed to be a six-hour journey to the International Space Station. Instead, the rocket suffered a malfunction shortly after taking off from Russia's spaceport in Baikonur, Kazakhstan. The spacecraft's two-man crew, NASA astronaut Nick Hague and Russian cosmonaut Aleksey Ovchinin, made an emergency landing in the craft's capsule in Kazakhstan. Rescue teams reached the landing site and confirmed that both men are alive and in "good condition," NASA wrote on Twitter. "[Nick Hague] and Alexey Ovchinin are on helicopters, making their way back to Baikonur, Kazakhstan. Search & rescue teams report that they remain in good condition after a safe landing following an issue with their launch on a Soyuz earlier," NASA tweeted. Russian state news agencies reported that the two men were flown to the town of Jezkazgan in central Kazakhstan to undergo medical examinations, after which they were brought back to Baikonir. NASA published a photograph of the two men embracing their families at an airfield in Baikonur. The head of Russia's Roscosmos space agency, Dmitry Rogozin, said that it was creating a state commission to investigate the cause of the crash, and deputy prime minister Yuri Borisov announced that Russia would be suspending manned flights until the incident could be reviewed. The malfunction occurred two minutes and 45 seconds into the flight, when the astronauts would have been about 30 miles up and just after the rocket's first stage had separated. The moment the booster rocket failed was captured live as Roscosmos streamed the launch on its website. As the booster failed, a camera inside the craft's cockpit showed the two astronauts being jolted sideways. In the broadcast, Ovchinin can be heard saying, "Booster emergency," and then, "That was a short flight." The ship's capsule disengaged from the rocket and the two men plummeted back towards Earth, coming in at "a sharper angle of landing compared to normal," NASA said. The capsule's parachute opened and the two landed on an empty Kazakh steppe, with NASA tweeting they had reached the ground 42 minutes after lift-off. "We avoided the worst development of events," Rogozin said in an interview on the state news channel Russia 24. A native of Kansas who was selected as an astronaut in 2013, this was Hague's first space flight. He and Ovchinin had been due to spend the next six months aboard the ISS. The cause of the booster failure is unclear. It is the most serious in a string of Russian rocket failures in recent years and represents another blow to the country's already troubled space industry. In 2016, Roscosmos was forced to ground its Proton rockets that carry satellites into orbit after 70 engines had to be returned to production lines due to faulty parts, the Associated Press reported. A number of Russia's unmanned cargo rockets have exploded or been lost after lift-off in the past five years, but this is the first time a manned Russian launch has failed since 1983. Some of the failures have been blamed on corruption within Russia's space industry, which has been plagued with allegations of poor quality control and theft of components. In 2015, one of the country's main suppliers of spacecraft launch systems of was accused of embezzling $128 million. On Thursday, Russia's Investigative Committee, the equivalent of the FBI, announced it was opening a criminal investigation into whether there had been any violations in the rocket's construction. Officers were searching offices at the Baikonur spaceport and were confiscating documents, the Committee said in a statement. The suspension of flights comes as Russia's monopoly on ferrying astronauts to the ISS is already under threat. 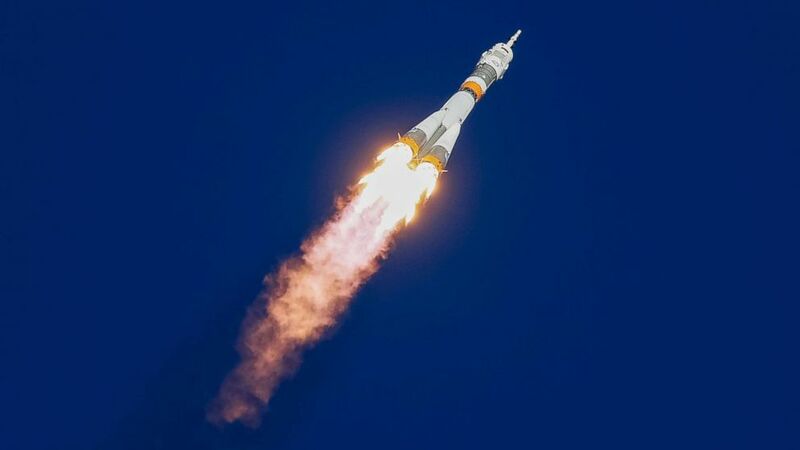 NASA has paid for places on Russia's Soyuz rockets for its astronauts to travel to the International Space Station since the American shuttle retired seven years ago. Recently though, the U.S. has been seeking to replace the route with contracts with commercial space companies, such as SpaceX. The Soyuz, however, currently remains the only way to reach the station. SpaceX and Boeing are both scheduled to have unmanned test flights with their own spacecraft in January and NASA astronauts are training for flights aboard the two companies' crafts in June and August. There are currently three astronauts aboard the ISS. They have supplies for around six months and can be re-supplied by unmanned craft. ABC News' Gina Sunseri contributed to this report.